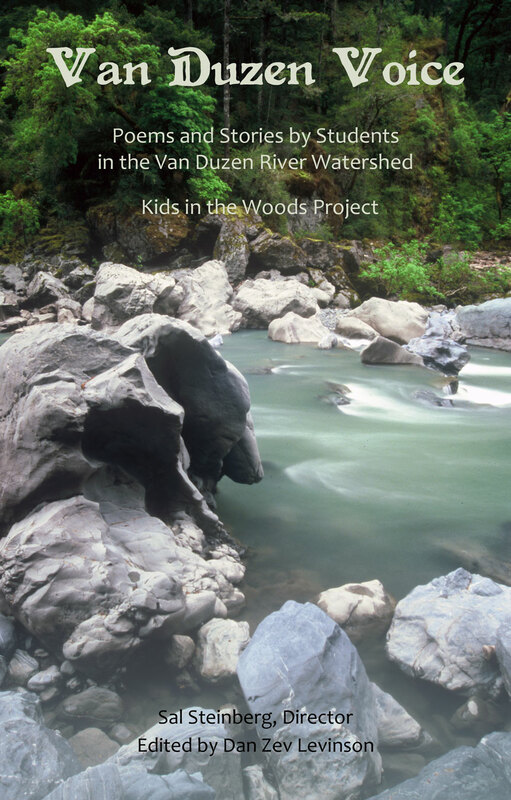 Van Duzen Voice is a collection of poems and stories from students in the Van Duzen River watershed, in Humboldt County, California. Sal Steinberg, director of the More Kids in the Woods program, teamed up with several organizations and individuals to work with the students. Dan Zev Levinson, of California Poets in the Schools, helped generate much of the poetry, and compiled and edited the book. The More Kids in the Woods program is a collaborative, interactive, evolving process designed to have a positive impact on students living in the Van Duzen and Eel River watersheds. It combines the efforts of Friends of the Van Duzen River, Six Rivers National Forest, Eel River Recovery Project, Trees Foundation, Humboldt Redwood Company, local schools, scientists, biologists, artists, and volunteers. The main goal of this project is to stimulate scientific inquiry in young people in order to develop the next generation of watershed stewards. The project engages students in the scientific process of observation and analysis while conducting real life studies of water quality and aquatic species; and simultaneously incorporates the arts, with students participating in video design, poetry in schools and in the field, musical compositions, and watershed drawings and sculptures. More Kids in the Woods helps local schools participate in World Monitoring Days so that they can share results with students from around the globe. It promotes awareness of the bigger issues facing our watersheds—such as high temperature, low stream flow, algae buildup, pH, sediment—and how these factors affect salmon survival. More Kids in the Woods connects students with forest and watershed resources, and encourages classroom teachers to use ecology principles as tools to master content science standards, while teaching about the need to conserve water and ensure water quality. The Van Duzen Voice can be found at Amazon.com, or you can order the book directly by clicking here. For more information, see www.fovd.org, www.eelriverrecovery.org and www.cpits.org.